Trend Micro products leverage the ‘Smart Protection Network’ (SPN) which is essentially Trend Micros cloud network providing analysis and protection against malware and other malicious threats. The enterprise protection products have the ability to talk direct to the SPN or you can install a local appliance and configure your systems to talk to that and only go to the SPN if they do not have communication to your local appliance. 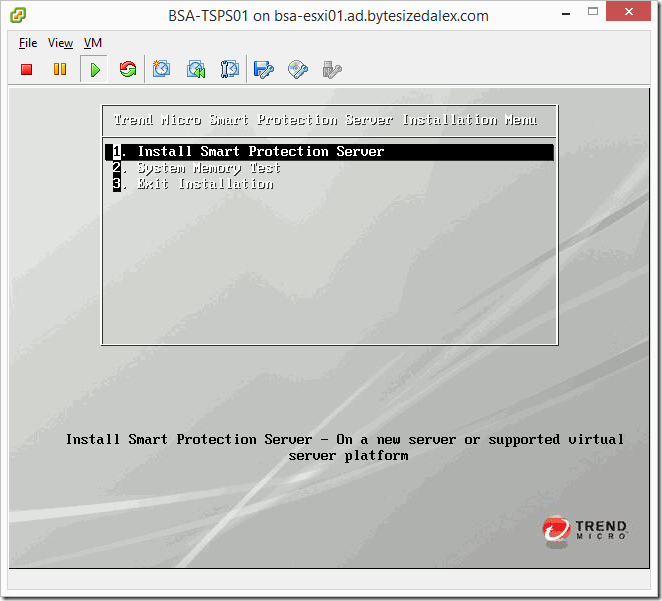 Next I have some useful links for the Trend Micro ‘Smart Protection Server’ (SPS) appliance – this is a locally installed appliance which your Trend Micro products connect to and forward URLs or file hashes for verification. In a production environment I strongly recommend the deployment of multiple SPS appliances for load balancing and high availability. Trend Micro products which can be configured to use SPS appliances typically give you the option to either direct traffic to a collection of SPS appliances in order or randomly. When running multiple SPS appliances I would suggest targeting them randomly to balance the load though of course a lot depends on your setup and networking. I’m going to deploy to my home lab running on VMware ESXi, you can deploy the SPS appliance on other hypervisors – check the installation guide link above for full details. I created a virtual machine in ESXi, the summary settings are displayed below for reference. Now it is time to power on the machine with the CD ISO image attached and run through the installation. If you feel the need you can run a memory test using option 2 though I don’t feel there is much need for this on a virtual machine install. Selecting option 1 proceeds with the installation. The installer will jump between a few screens as it loads drivers and other components, once complete it will return to the installation menu where the option to select an appropriate language is presented. Next we need to accept the end user license agreement (EULA). Time to select the appropriate keyboard layout. The installer provides a summary of the hardware configuration, at this point it would also identify any issues in terms of hardware configuration, e.g lack of resource. Now we need to configure the appliance hostname and network settings. Obviously this configuration is dependent on your own network setup. In my case I’m going to set everything manually for this appliance. Clicking on the ‘Edit’ button will provide access to the IP address assignment and will then unlock the ‘Miscellaneous Settings’. This screen presents a world map with yellow icons denoting various regions to aid in time zone configuration. It is very important to configure a strong password for the appliance root and admin accounts. As always using a lengthy combination of alpha, numeric and special symbols is the best approach. Finally we are presented with a summary of our settings, clicking to install presents a warning to indicate any data on the disk will be erased as part of the installation. The virtual machine can now be rebooted and we can then move on to the web configuration. If you check the VM status you will notice that the VMware tools do not show as installed, Trend Micro include the VMXNET3 driver but nothing else. Personally I’ve always installed the tools to benefit from the other features they provide and I’ve never had an issue on my production systems so I always install them at this point. To install the tools it is necessary to logon to the SPS appliance as the root user, the following commands can then be executed once the VMware tools installation has been launched. Once the VM has loaded the console will show a screen similar to the one below. 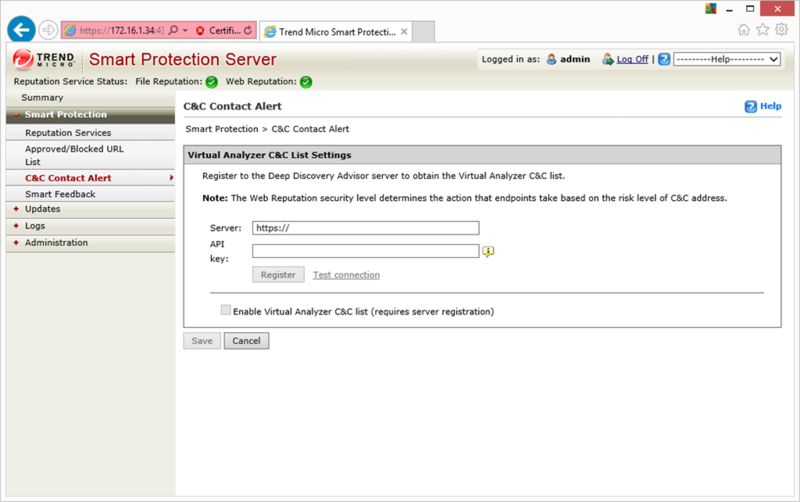 It provides us with the information we need to configure other Trend Micro products to use this SPS appliance as well as giving us the link to the web configuration page. Logon using the admin credentials created during the installation process. On first logon the system will walk us through a short setup wizard. There isn’t really much need to change any of these settings, the only two you might consider are the feedback and proxy settings. Once the wizard is finished the home page is displayed. It’s now time to configure the last few options – they are highly dependent on the environment so I will simply present them and where necessary provide advice. If you have a Deep Discovery Advisor you can register the SPS to it. In my production environment I configure SPS appliances to update every 15 minutes – this helps to ensure rapid deployment of definitions etc to help prevent zero hour/day exploits. I also leave the system to automatically check for program updates as this reduces management overheard and also keeps the appliance up to date with important patches. Depending on your requirements you can configure log management. 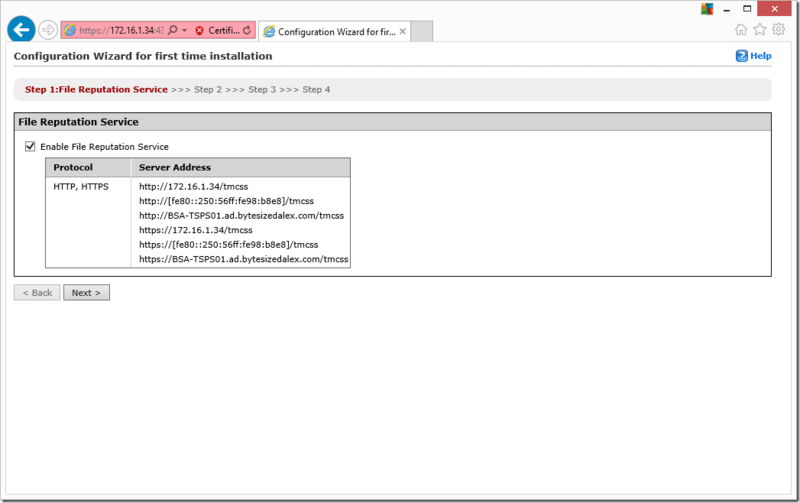 The appliance can be configured for SNMP and to forward notifications via e-mail. Diagnostics can be generated from the Support menu. There are other options and settings that I’m not going to discuss in this post – suffice to say at this point the SPS appliance is ready to service requests from Trend Micro products. As I said at the beginning I recommend multiple SPS appliances be deployed to balance load and provide high availability. Great guide, thank you. Just checking to see if you ever created the post for “How to change the SPS appliance certificate”? I have searched high and low about this topic but cannot find anything specific about it even on the Trend site. Your help would be greatly appreciated! That’s a great reminder! I just found a starting draft in my backlog that I never got round to finishing. It was rather easy once I got onto the appliance so I will write this up ASAP and hopefully it will help you out. I’ve had fun replacing certificates on other Trend products and to be honest with all sorts of systems so much so that now I see them as a fun challenge to figure out. Thanks for this guide Alex, We been running SPS for about a year now but noticed the VMware tools were not installed in our environment and I found it wasn’t as easy just installing through vCentre. Your guide on the tools install really helped. Thanks. Very useful blog, one to add to my favourites! Glad you found the information useful – kind words like this make writing these articles all the more fulfilling.